The First Officer Programme is designed to provide A320 and B737 operators with a predictable pipeline of high-calibre cadet pilots. 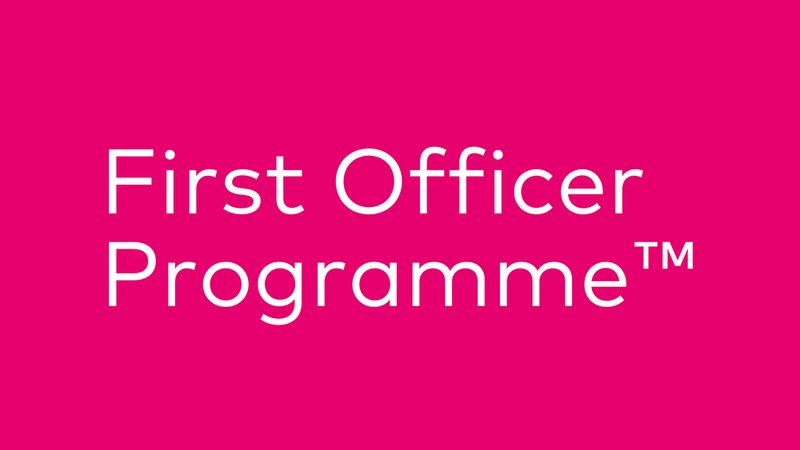 At a time when the cadet recruitment market is becoming increasingly competitive, the First Officer Programme gives partner airlines their own flagship cadet programme, without any investment or set-up cost. It's a comprehensive, all-in-one recruitment and training solution which is highly flexible and can be customised to your airline's individual requirements. As well as offering numerous benefits, The First Officer Programme also addresses many of the headaches, risks and costs airlines typically encounter when recruiting low-hour cadet pilots. VA will design and manage a co-branded marketing campaign to generate a high volume of applications, then handle all of the initial screening and selection process - including interviews and simulator assessments - reducing the number of candidates down to a high-quality shortlist, ready for final selection by the airline. The airline will have full oversight of each trainee's performance throughout training, via detailed online training reports, and will have the option to observe any training sessions or assessments. By selecting the best students from a large pool of applicants, and then delivering customised training to a high standard, partner airlines should expect to see a range of benefits, such as reduced internal recruitment costs. VA can also assist after the training is complete; liaising with your HR, Training and Flight Ops departments to streamline the on-boarding process. The financial structure is flexible, and can be adapted according to airline preference. With upfront costs being reclaimed gradually via a reducing bond, the long-term cost can be nil. The Stansted-based airline, which operates a varied fleet of Airbus and Boeing aircraft on passenger and cargo services, took a forward-thinking approach to their cadet pilot recruitment. Working together with the team at Titan Airways, we developed a cadet programme which was tailored to their unique requirements. VA managed the promotion and marketing (which attracted over 500 applications) and then the selection process, which resulted in 32 face-to-face interviews and simulator assessments. With the 500 applicants narrowed down to a shortlist of 12 candidates, Titan Airways conducted the final stage interviews and group exercises, and then subsequently oversaw the training conducted by VA.
For more information on the First Officer Programme and how it may benefit you, please contact us to arrange a presentation.